The timeline displays total and pedestrian fatalities in traffic crashes in the United States from 2001 through 2016. 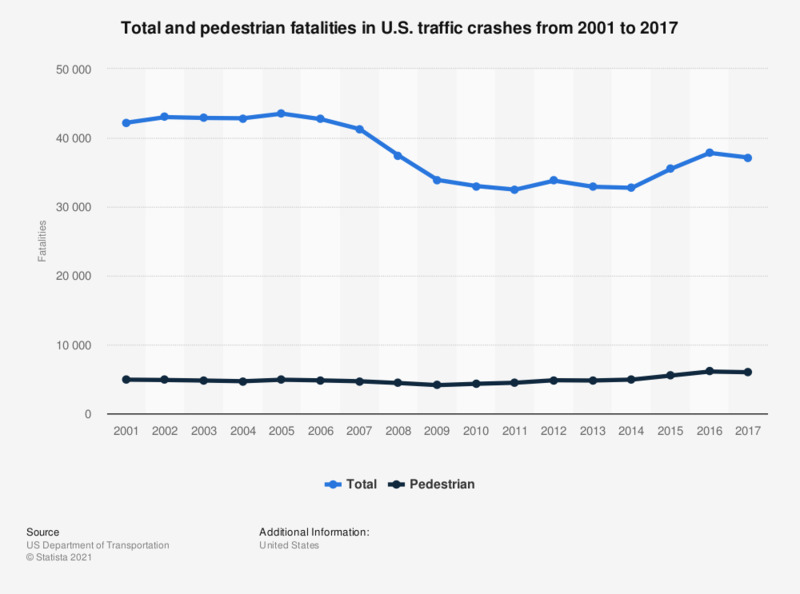 In 2016, almost 6,000 pedestrians died in U.S. traffic crashes, while total traffic-related fatalities amounted to 37,461. The figures for 2001 to 2006 were taken from a previous edition of the publication. Pedestrians are defined as any person on foot, walking, running, jogging, hiking, sitting or lying down who are involved in a motor vehicle traffic crash. A traffic crash is an incident that involves one or more vehicles where at least one vehicle is in-transport and the crash originates on a public traffic way.